The United States and Afghanistan share a common vision for an Afghanistan that is prosperous, democratic, self-governing, and respectful of human rights. The determination of the Afghan people and the on-going commitment of the Coalition Partners have created an environment of stability and success. 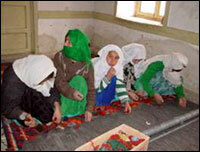 The U.S. has contributed over $900 million in assistance to the people of Afghanistan since 2001. While waiting with his son outside the clinic, Nasser said of the Americans, "They are here, they are welcome, and they would help us rebuild our country, and we are grateful for that". The U.S. is initiating a $60 million program to build or repair 1,000 schools, train 30,000 teachers, offer accelerated learning programs to 60,000 students and print 15 million textbooks for 2.9 million students, 30 percent of whom are girls. The Afghan government and international organizations are assisting the returning refugees. 2.5 million Afghans have returned home, the largest refugee repatriation in the world in the last 30 years. 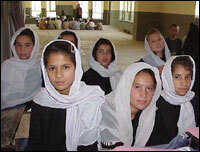 The U.S. has helped with a total of $185.5 million since the beginning of the Afghan crisis in September 2001. President Bush welcomes the start of construction on the Kabul-Kandahar-Herat highway, Afghanistan's main transportation artery. The U.S.-Japanese-Saudi Arabian-Afghan partnership to build this road is part of a comprehensive, multi-billion dollar international reconstruction effort for Afghanistan. 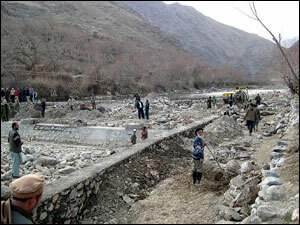 The road is a tangible example of the long-term commitment of the international community to Afghanistan. The road project is an important effort to help the Afghan people provide a better future for their country. At the same time, this road, along with others that will connect Afghanistan to its neighbors can set the stage for a complete transportation system that will integrate the country, increase trade, and establish links through Afghanistan from the Indian Ocean to Central Asia and along the "Silk Road", bridging East and West. 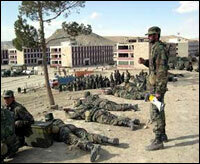 The Afghan government plans to create an army of 70,000 to defend their country. As of April 5, 2003 the ninth battalion of 716 Army recruits began basic training. The new recruits will be trained by fellow Afghan non-commissioned officers, instead of by Coalition Partners. "We're very hopeful and at the same time very thankful that the coalition supports us and will continue to do so without ethnic or linguistic divisions, so that this national army will be able to rebuild the country for a brighter future," said Aziz Ullah, who is now a sergeant with 120 men under his command"